This is the Appliance Hunter back again, this time I’ve been searching hard to find you the best bagless vacuum cleaners. Surprisingly slim pickings. I only came up with 4 bagless models with the Shark Upright being my favourite. Have a look at the table below for the overview and to buy on amazon or keep reading for some more information and the full reviews. Hope this helps! Looking at most vacuum cleaners you might not see much of a difference between bagged and bagless. Each has its own benefits but in my opinion, there are more drawbacks to the bagged variety. So why buy a bagless vacuum over a bagged? The most obvious benefit is cost. With no bags to buy your cost to operate the vacuum is minimal. In many cases the bagless vacuums are also more efficient as they are less likely to get clogged and need more power to maintain suction. This ends up costing less in electricity over time, as well. In most cases, the cylinder is clear on a bagless vacuum so you can see when it is full and needs to be emptied. Not needing to open it up to see how much dirt is in there also makes for tidier upkeep. Opening up a bagged vacuum can spill dust making more work for yourself. It’s hard to know how many bags you will throw away during the lifetime of your vacuum, but it’s safe to say it is not having a positive impact on the environment. I also remember what it was like to have to dump an overfull vacuum bag. And the spills that would cause. It’s nice not only to see when you need to dispose of the dust but also decide when you want to do it. You aren’t likely to throw away a half-full bag, thus wasting money. But you may decide to dump a less full canister since there is no cost associated with it. The only downside that I can see is that there are some models whose chambers are not the easiest to open and dispose of. But, the same could be said for the bagged vacuums, too. It really does boil to personal preference and maybe also that old habits die hard. If you just can’t break free from buying bagged models, then you will still find many great options to choose from. The Shark NV801UKT is everything you need in a bagless vacuum cleaner. It’s got superb cleaning power and it’s a lift away model so you can take out the middle and carry it so you can clean anywhere. It’s also got Duo Clean action which is 2 different roller brushes that work together to give you maximum suction and cleaning power. The first roller is soft which is good for hard floors and the second brush features lots of smaller brushes to beat the carpet and free up all the trapped dust. The vacuum is a 3 in 1 tool. Its main function is a stand-up cleaner, but it can also be taken down to the canister and hose and used as a cylinder vacuum. Then it can also be transformed into a handheld vacuum for use in a car or on furniture. Even as a handheld unit, it uses a roller brush to really tackle pet hair on any type of surface. HEPA filters trap dander, dust mites and other allergens in the vacuum leaving the air clean for allergy sufferers. A superb bagless vacuum and one of the best you can buy. For under £100, you can still expect to get a reliable and effective vacuum. Lightweight, but still packing a punch is the VonHaus bagless cylinder vacuum. At 5.5 kilos, it is lightweight enough to carry onto stairs or into some hard to reach areas of your home. The power is a respectable 700 watts, but what makes it a great buy is the 170 watts of air power. That’s great suction for the power and results in a vacuum that easily picks up even the most ingrained dust and dirt particles. The suction level can be regulated with an easy to use dial. Use the high speed for floors and low speed for carpet. Deep pile rugs, however, can use something in the middle. A washable HEPA filter traps up to 99.7% of the dust particles including bacteria that it picks up. Keeping that out of the air is a boon to allergy sufferers, but also helps keep your home dust free for less frequent hoovering needed. Not only is this an economical choice based on the price you pay for it, but it saves money long-term in electricity costs since the motor is efficient. 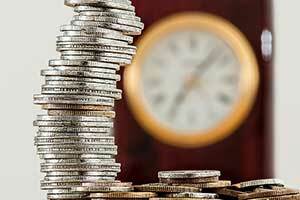 Add to that the savings in vacuum bags and HEPA filters, and you have a winning formula for a vacuum. Whatever reason for needing a lightweight vacuum, you don’t want to skimp on performance. If you have a bad back or need to hoover the stairs without worrying about your vacuum falling, then you should consider the Karcher VC5 bagless vacuum. At 3.2 kilos, it is light enough for any user to handle with ease. It’s essentially a stick vacuum that also doubles as a handheld like many do. There are some nice features that make it stand out. It is easy to use since the steel hose is telescopic. It collapses into the body and becomes a handheld duster perfect for using in the car or furniture. For a small vacuum it has a robust 500-watt motor, as much as some full-sized vacuums. The suction has four different levels. Setting one is good for light dusting while setting it to four will give you a deep clean on just about any type of carpet. In quiet as well. The noise level is only 74dB and that is on the highest suction setting. Cleaning stairs is a breeze when you consider it is collapsible. Simply set the hose all the way back in the body and it can easily get to those stairs. It’s even good for most pet hair. As long as you don’t have a breed with long wiry hair that is in a constant moulting state. For most small flat-sized pets, it will handle the job nicely. 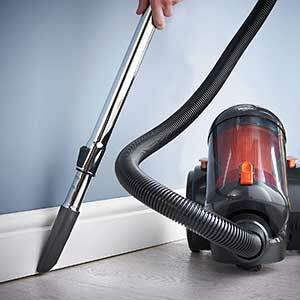 The only real downside to using a stick vacuum like this is when you need to dump the chamber. You have to tip the unit upside down over the bin and that can be fairly messy if you let the dust box get too full. Unfortunately, the window on the side that is meant to indicate when the bin is full is hardly transparent, requiring you to open the unit to see. For attachments you get a crevice tool, a soft brush head for dusting and an upholstery brush head. In all, if you don’t have a big area to clean, or you just need a second hoover for smaller jobs, then I highly recommend the Karcher VC5 bagless. 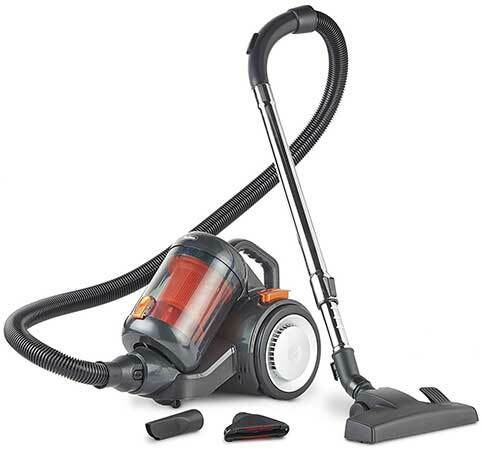 It is one of the best lightweight bagless vacuums and at a decent price. Dyson is famous for its innovative and well-designed vacuums. The Dyson multi-floor vacuum has so many small details considered that it is hard to beat as far as performance goes. So why didn’t it take the top spot for lightweight vacuums? Because it is not as lightweight as I think it should be at 6.7 kg. For an upright vacuum, that is very lightweight as most come in at least 30% heavier than that. The weight is mainly in the ball so it is bottom heavy making it feel much lighter, as well. It is such an excellent bagless vacuum that it had to be on the list. It is not energy efficient at 1100 watts, but the suction power is an incredible 220 air watts for air flow. It can handle dirt stains from muddy boots or pets. And excels at removing pet hair. Allergy sufferers appreciate the fact that Dyson cyclones capture microscopic particles down to 0.5 microns in size, including pollen, mould and bacteria. The famous ball technology makes it one of the most manoeuvrable vacuums out there making quick work of just about any room. As its name implies, it can work on any surface from tiled floors to deep pile shag rugs. The hose extends to 5 times its size. You can leave the vacuum at the bottom of the stairs and clean most stairways without needing to lift the vacuum every step of the way. The clear canister can easily be seen when it is full and ready to be emptied. And emptying it is simplicity itself. A one hand operation all the way through allows you to remove the dust box and empty it over the bin as it opens from the bottom. The Dyson Multi floor bagless vacuum is ideal as a primary vacuum if you have a large area that needs cleaning.